The culinary team at Grand Hyatt Singapore takes inspiration from one of our favourite local milk tea beverages to craft this indulgent nod to favourite food memories. Its decadent core combines the richness and creaminess of milk tea with the slight bitterness of dark choclate truffles. Bursting with sweet and sour flavours, this snowskin mooncake from Singapore Marriott Tang Plaza Hotel is reminiscent of our childhood favourite lime and vanilla popsicle. The bright orange‑hued confection is filled with an invigorating and luscious mango yoghurt paste that is paired with a lime margarita truffle centre for an alcoholic kick. Executive Chinese chef Leong Chee Yeng of Jade restaurant at The Fullerton Hotel Singapore debuts a citrus creation, interestingly shaped to resemble the ancient Chinese belt buckle. Each pale yellow treat is packed with a refreshing yuzu paste, and generously studded with crunchy chia seeds for added texture. Light and not cloying, it’s the perfect mid‑afternoon snack. 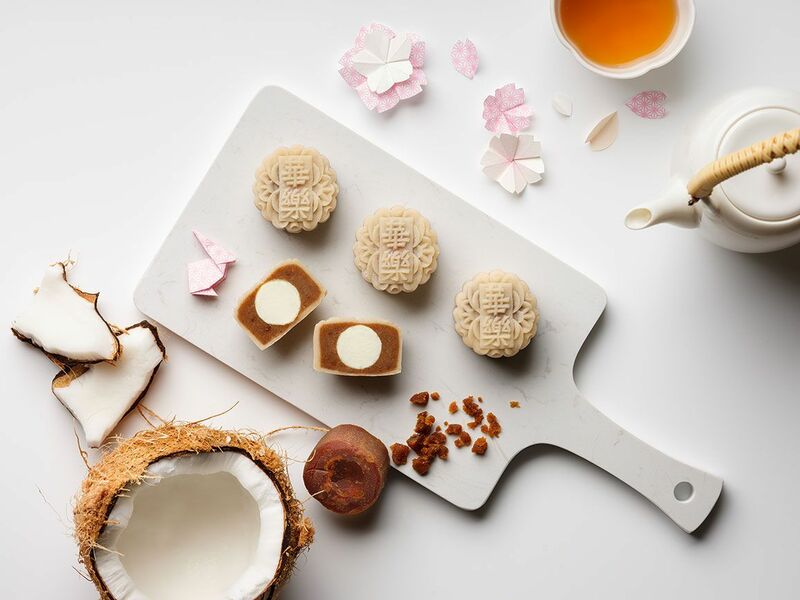 If you think this new offering from Goodwood Park Hotel’s sounds familiar, that’s because this is version 2.0 of the soursop snowskin mooncake first introduced in 2009. The skin is an eye-catching lime green colour, but the real beauty is the addition of the zesty calamansi puree that complements the sweet and juicy pulp of the soursop. This option from the Raffles Hotel Singapore is not only pretty to look at, but also flavoursome and healthful. There’s little guilt in indulging in its delicious filling made with nutritious berries, interlaced with organic chia seeds and tangy Greek yoghurt. Carlton Hotel Singapore feeds our love for gula melaka, made with coconut palm, with this interesting concoction. It comprises a soft and translucent skin that contains that familiar and deliciously sweet filling, elevated with a crunchy white chocolate truffle. Our pick for the ultimate indulgence. The salted egg yolk trend shows no signs of slowing down, as evinced by Fairmont Singapore’s fresh offering. It’s the perfect balance of sweet and salty, thanks to the salted egg caramel that complements the dark chocolate praline. An ideal snack or post-dinner treat. The celebration of durian in our favourite confections never gets old, which is why this tantalising creation by Xin Cuisine Chinese Restaurant is a welcome new addition. It’s as luxurious as it gets, with lush, creamy durian paste hidden within a purplish-blue shell naturally coloured using the blue pea flower. Summer Palace’s Chinese dim sum chef Leong Kwok Sing has partnered with Manhattan’s Philip Bischoff to create an alcohol-infused mooncake that reflect their reputation for serving up only the best. It’s rich and chocolatey, and the infusion of the six-year old rye whiskey is the complementary sharp finish you naturally crave. A blend of white lotus and pistachio paste is infused with the Paris-Singapore tea, a green tea variety known for its fragrant and fruity notes. Encased in a translucent jade green skin, it's rich and indulgent but not overly so, and boasts a delicious Amarena cherry heart.